Sydney Harbour Cruises, Attractions - Places to Visit and other tourist information for visitors, see Sydney Harbour - Cruises, Attractions and Harbour Places to Visit. 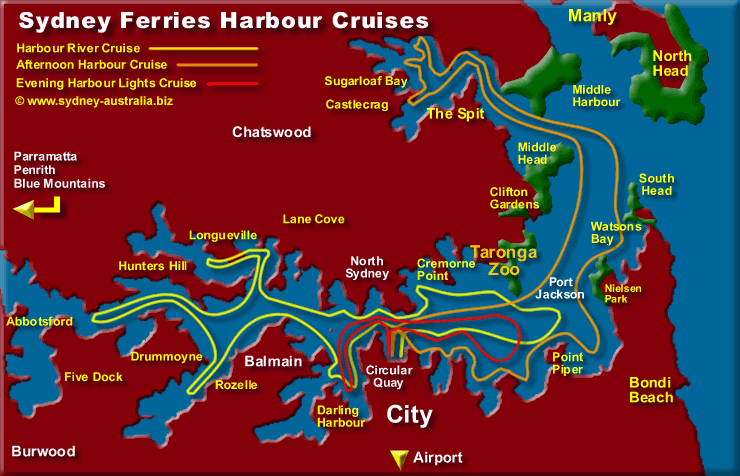 One way to enjoy Sydney Harbour is to take a cruise. Many are available, including lunch, dinner and evening cruises at Circular Quay at the foot of Sydney CBD. The most prominent attractions are of course the Sydney Harbour Bridge, called the ‘Coathanger’, or simply ‘The Bridge’ by Sydneysiders and the Opera House. Taking nine years to build, the bridge design and building team, headed by Dr John Bradfield was completed in 1932, spanning 503 metres. Central Sydney Tourist map - see South Sydney CBD Map - The Rocks Map for the Opera House and The Rocks. Sydney Harbour Photos: Free for personal use: Sydney Desktop Wallpapers.